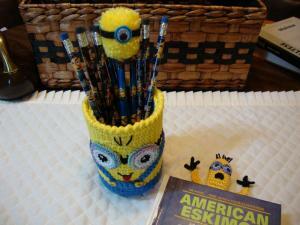 I finally took some pictures of that Minion pencil holder. I am done with that set!. Now I need to start working on the other one. 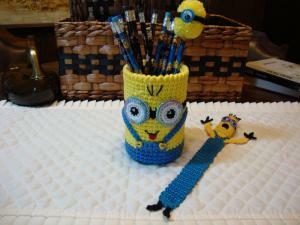 This pencil holder is little unusual because got 2 faces. 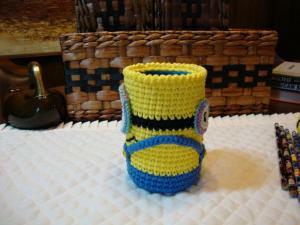 That is why I call that "Conjoined Minions" LOL. I just could not decide IF I should make that with two eyes? or one?. So I did both on one container:). I used can from vegetables for inside &. I lined that with felt. I know many of you already seen pictures of that bookmark & pom-pom Minion pencil. Here it is that whole set. PS: I can see now on those pictures on the side with "2 Eyes" that something is not right, That is one of those ends of that yellow yarn I waved on the inside. Because that cover is very snug over that can, that extra strand of that yarn that I waived is pushing that part out. I did not knew is going to be that snug-tight. I will fix that. I will pull out that end of that yarn and secure that end of yarn a different way. I am going thru a very bad time with my allergies & sinus infection that is why I probably did not seen that before I posted those pictures. I love it. 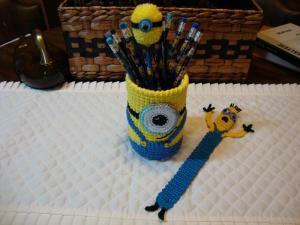 The pencil holder is just perfect. Absolutely adorable! Krys, you've out done yourself. You are so clever! They ARE conjoined! If I was a kid, I'd be crazy about a set like this!!! Conjoined Minions- Outstanding! I adore Minions- so mischievous. Everything goes together so well. Any suggestions where to get the Minion pencils? 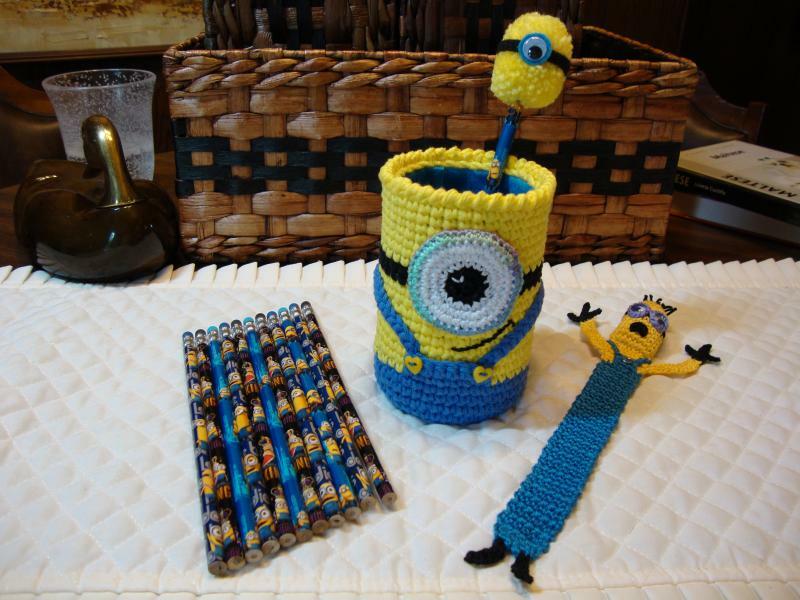 I'd love to make some of these for my great-great nephew if it's ok with you. He has a new baby brother due shortly and I'd like to make something for him too. This would be perfect. Thank you Reni and Joyce for a very nice compliments! . Reni I take that as a big compliment that you are planning to make that:). Thank you Krys. I appreciate your sharing this project with us. I love it!! 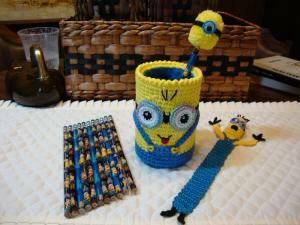 Minions are probably one of my favorite characters! I just find a better deal on those pencils- Amazon.com. Just for little over a $1,00 you can get twice as many- 24 of them instead of 12 like I did. And I think shipping comes free with that. The other deals I think the shipping comes free only for "Prime" costumers. That is so cute! Starting school with this set is sure to make any young person happy!